2 Double bedrooms. 1 Twin bedroom. 1 Bunks for 2. Description of Property: Parts of the house are about 200 years old, and it has been faithfully restored to retain its original features while providing all modern comforts. 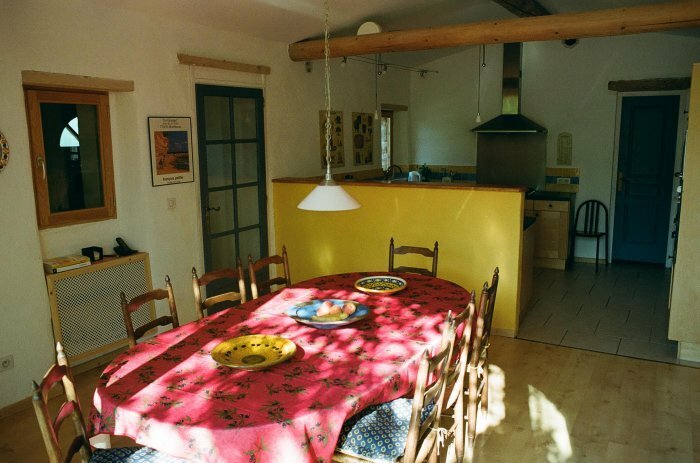 The house features a magnificent open plan kitchen/dining room in a space that has been converted from an old barn. The original massive roof beams have been retained, as has the original barn opening, now with fully double-glazed French windows, which provides access out to the garden. The kitchen is equipped to a very high standard. There is a hi-fi with CD player; FM and internet radio; i-pod connector; and ceiling-mounted loudspeakers. The dining area has a large antique dining table that extends to seat 12 people in comfort. Behind the kitchen there is a small utility room with washing machine, tumble dryer, and iron and ironing board. Next to the utility room is the downstairs shower room with wash basin, WC, and shower. 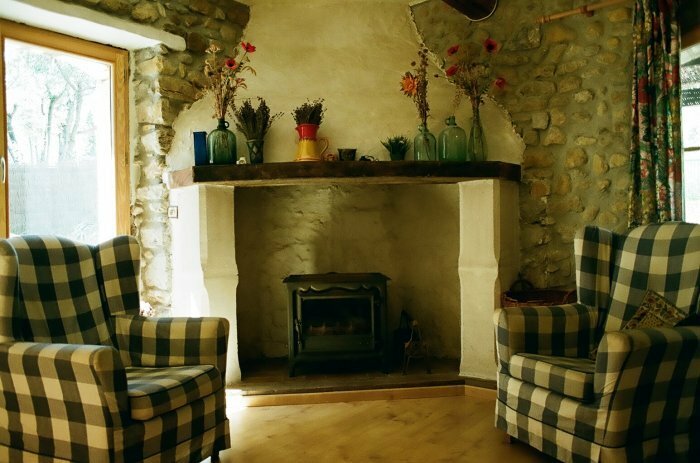 The sitting room is equipped with French digital TV plus satellite TV from the UK. There is one double bedroom downstairs with en suite bathroom. Upstairs there are a further three bedrooms and another bathroom. 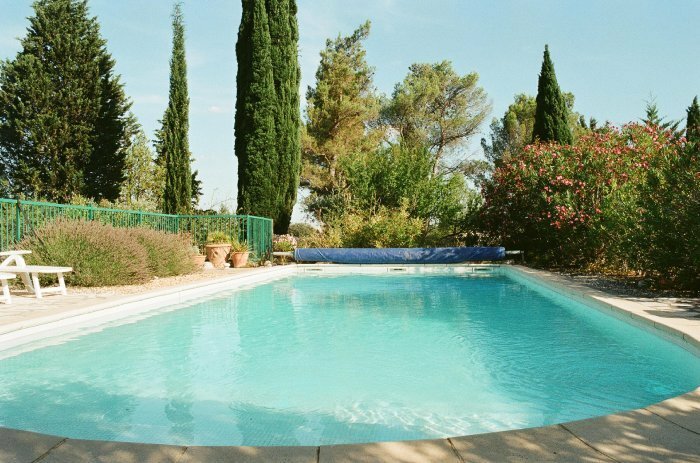 Outside Amenities: The grounds are about ¼ acre, with large swimming pool (12 x 5 metres). 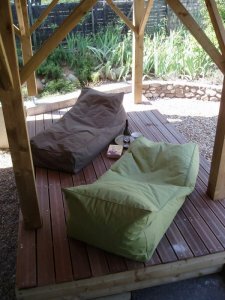 There is a pool house with table and chairs, and sun loungers, and a shower with solar-heated hot water. Close to the house is a shady pergola with sun deck - perfect for snoozing! The rest of the garden comprises an olive grove, ancient well (covered and gated), and raised beds separated by river gravel. There are views to open country to the west, and over vineyards to the north. The property is fully fenced with gates that can be closed to allow small children to run around freely, although our lane is not a through road and so has very little traffic. A barbecue is provided. 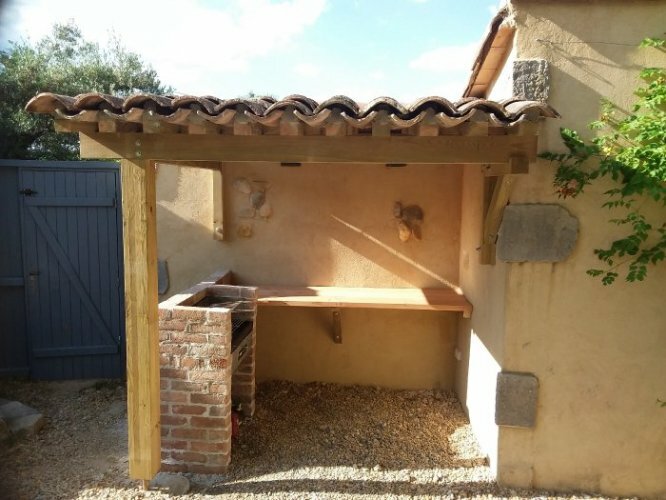 Surrounding Area: Mas des Costes is within one hour’s drive of Nîmes, Montpellier and the Mediterranean beaches in the Languedoc-Roussillon region of the south of France. 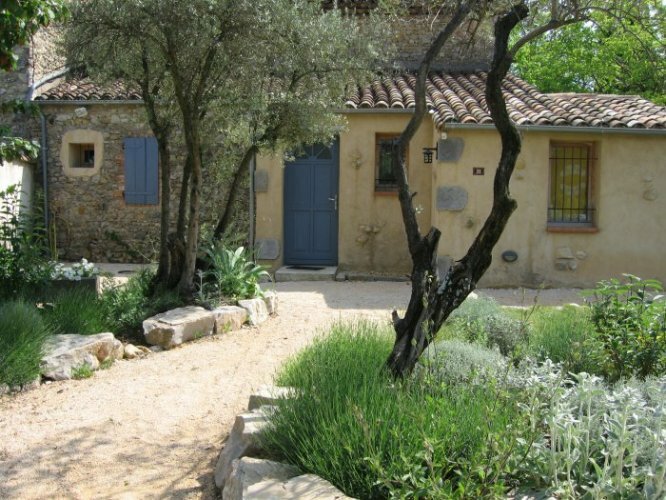 Its character is very much that of Provence. Our local market town is Anduze, and the house is situated outside the town in the quiet rural community of Tornac. The Cevennes and Ardeche regions are close by, and we are within easy reach of historic towns such as Avignon, Arles, and Uzes. The house is less than 10 minutes drive from Anduze which offers shopping, local markets, craft shops, and restaurants. In the surrounding area there are many local craft centres, vineyards and museums. Anduze is the point where the foothills of the Cevennes meet the Languedoc plain. It is, therefore, the ideal base for walking in the magnificent Cevennes National Park using the numerous way marked trails. Robert Louis Stevenson travelled here and wrote about this region in ‘Travels with a Donkey’. (It is possible to retrace Stevenson’s steps, using donkeys to carry your luggage). The Cevennes has been designated a site of world environmental importance by UNESCO. 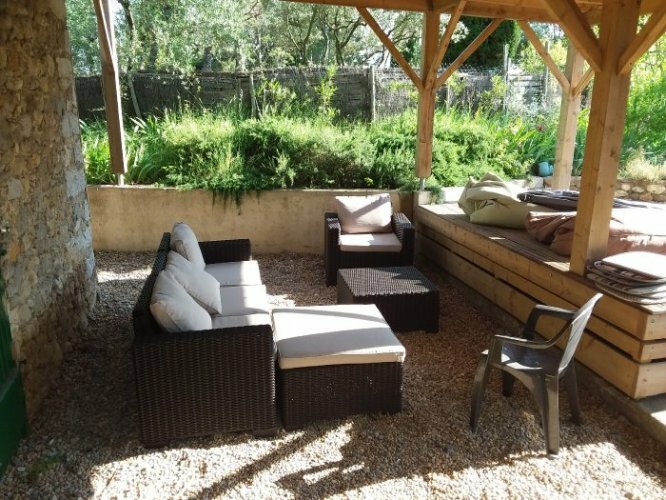 Anduze has a vibrant international community based around an extraordinary salon de thé where both local and international residents meet for French/English conversation classes, cultural events, and much more, all year round. Central heating (Gas central heating in most rooms). 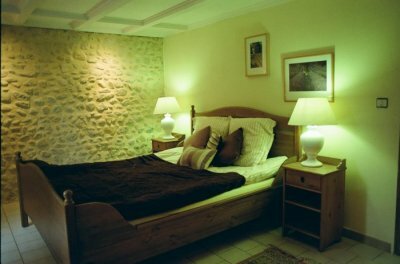 In addition to the gas central heating there is a wood-burning stove in the sitting room, and electric radiators in the bedrooms. The kitchen has a large American–style fridge-freezer with ice cube dispenser, chilled filtered water dispenser, and a bar. The pool is usually open for use from 1 May – 30 September, although the weather is normally warm enough for the swimming season to be extended well into October. Parking space for 3 cars. Pricing Info: The prices quoted are for long-term off season lets only. Please visit our website masdescostes.co.uk for short term let prices in the summer months. The price includes water, broadband, standing phone charges, and local taxes; but, in the off season, excludes electricity, gas, and telephone usage which are all charged at cost. Logs for the wood burning stove are not supplied but are available locally. There is a refundable damages deposit of €200. 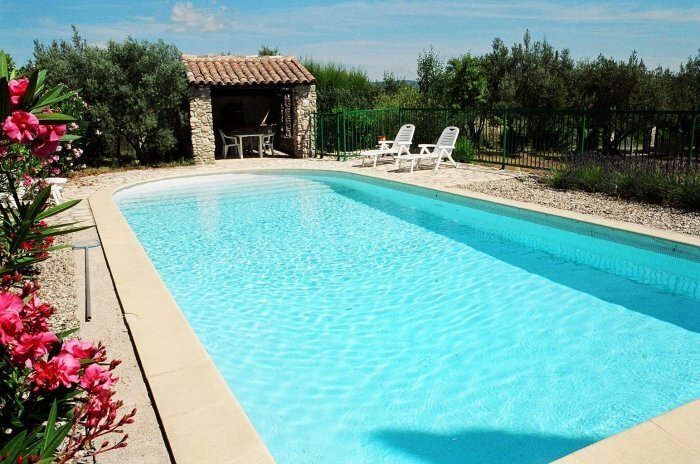 Mas des Costes is available for long term lets from about mid-September to about mid-April. Outside this period it is available for short-term lets only.